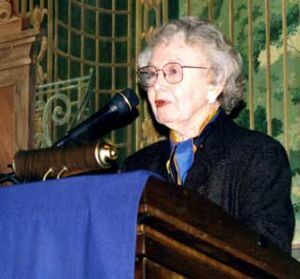 The Graduate Theological Union community mourns the loss of Jane Dillenberger, Professor Emerita of Theology and the Arts, who died at her home in Berkeley on November 11 at the age of 98. A pioneer in the dialogue between religion and modern art, Professor Dillenberger was trained as an art historian at the University of Chicago and Harvard. During the course of her long career, she taught courses in art and religion at Drew University, the GTU, San Francisco Theological Seminary, Pacific School of Religion, Jesuit School of Theology in Berkeley, the Dominican School of Philosophy and Theology, and elsewhere. Her published books include Style and Content in Christian Art (1965), Secular Art with Sacred Themes (1969), The Religious Art of Andy Warhol (1998), and most recently a book co-authored with GTU Ph.D. graduate John Handley on The Religious Art of Pablo Picasso (2014). Professor Dillenberger served in various curatorial capacities at the Newark Museum, San Francisco Museum of Modern Art, and the National Collection of Fine Arts. Her most important exhibitions were in the 1970s at the Berkeley Art Museum, where she co-curated “The Hand and the Spirit: Religious Art in America, 1700–1900” with art historian and museum director Joshua Taylor, and “Perceptions of the Spirit in 20th Century American Art” with her then-husband, the late John Dillenberger. A memorial service will be held at St. Mark’s Episcopal Church at 2300 Bancroft Way in Berkeley on Saturday, December 6, at 2:00 pm. Following the memorial service there will be a reception co-sponsored by the Center for the Arts, Religion and Education (CARE) and the GTU in the Doug Adams Gallery at 1798 Scenic Avenue in Berkeley.